Until I realized that wanting to do too much actually results in me doing nothing. Not with any degree of proficiency, anyway. I just need to let some things go for a bit before I lose my grip on everything. I’ve decided that I can’t go through the rest of the HTRYN process with this version of Witches. The distant POV and voice are just too much for me to ignore comfortably, even while revising. And the little voice in my head–I think it’s the Muse’s other personality–is jumping up and down and screaming so loudly that I can’t think straight. I even gave up on reading through the last ten chapters or so. I don’t think I have a copy of the very first draft of Witches, which is probably a blessing, but my writing has changed so much since this version, that it is proving difficult to read. My voice is SO different now! Good morning. I’m just working through Holly Lisle’s How to Motivate Yourself workshop a bit this morning. She always has such interesting videos, like the one I just watched about communication between the right and left brains (and what happens when that connection is severed). I think my right brain influences me a lot. That would be my instinctive reactions, my desires, my hunches. My more introspective side, if you will. Two people I’m close to are strongly left-brained, though. One of them…I don’t think his right brain gets much say in his life at all. The other, well, I think her right brain holds some sway. It’s interesting, actually, considering the differences. It’s like having two different people in your head. I’ve always said I had two personalities. Now I’m off to ponder my results from this morning’s exercises. And see if I can strengthen that connection between my brains. Holly Lisle is looking for readers and writers to build a community that fosters the growth of new writers. The readers will have the opportunity to help writers they support to grow and learn, the writers will gain support and assistance where they need it. Holly does wonderful things for other writers, and this is a fantastic new idea of hers that is still in beta development. If you’re interested, check it out here. I had forgotten how detailed and helpful Holly’s lessons are. The results I got for the Shadow Room technique surprised me and might have generated another story idea (assuming I ever get this one written…and some others revised…and the other partially-finished MS written…). So, yeah. I’m dedicating this summer to getting my life to where I want it to be. A big part of that is writing. Game on. …okay, not really re-thinking. Let’s just say I’m going to try something new (or, actually, old). Confused yet? Let me explain. Have you heard of Holly Lisle? If you haven’t, well, you don’t know what you’re missing out on. 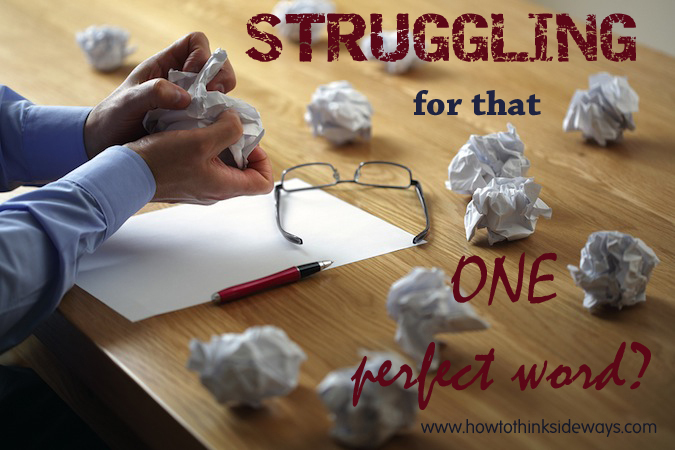 Holly is a rarity: a mid-list author who actually makes a living with her writing. She’s smart, she’s a great writer, she knows what she’s doing, and, more importantly, she’s really big on paying it forward (she did start Forward Motion, after all). She spends a lot of her time helping her fellow writers out. To that end, she has created lots of helpful things, from the smaller workshops like How to Create a Language, How to Create a Character, How to Write Page-Turning Scenes…and she has also created huge, incredibly detailed classes Like How To Revise Your Novel and How To Think Sideways. I was in the original HTTS class, as well as the original HTRYN class, and I can’t even begin to tell you how much difference these two classes made in my writing. The way Holly thinks, the way she breaks things down using plain language, worksheets, examples…well, it got me thinking in ways I’d never thought before (which was the point, right?). Since I don’t have much done on The Fall–in reality, I have only a handful of pages written, basically no pre-work, and haven’t touched it in weeks–I’ve decided that I’m going to take it through HTTS. I know the end result will be much closer to the story I have in my head, much more true to the vision I can see for the story. It will just be better. Yeah, it’ll be a lot of work and it will take me a while, but in the end, it’ll be worth it. I’m a huge fan of Holly’s writing in general, and I know her courses can really get results–if you’re willing to do the work. I am. I haven’t been published, but I’ve gotten some partial manuscript requests because of her courses, and I want to give everything I can to The Fall. I’ve also decided to become one of Holly’s affiliates. I do believe whole-heartedly in her methods, her teaching, and her results, and if you have any interest in checking it out for yourself, go here. If you aren’t a writer, but you’d like to read a great book, you can check those out as well.